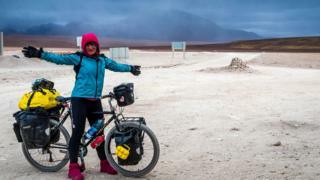 Adventure cyclist Ishbel Holmes has competed for Iran and travelled solo around the world, but her early life was difficult and traumatic. Thrown out by her mother at 16, she found herself homeless and plagued by suicidal thoughts. When she was made to leave a homeless unit five years later, she realised she had to make a change. 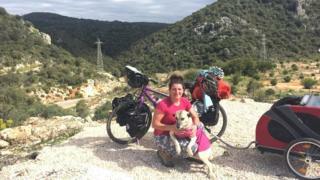 She started cycling and set off round the world – leading to an encounter with a stray dog that was to transform her life forever. One of my earliest experiences of being on a bike was in Manchester, when my dad used to cycle across the city to get a 20kg sack of potatoes that was a few pennies cheaper. I was still in nappies, and I used to sit in a little seat beside his saddle with the potatoes behind me. My dad was studying there when he met and fell in love with my mum. It was the time of the Iranian revolution, and Iran suddenly stopped payments to overseas students, to try to encourage its nationals back. 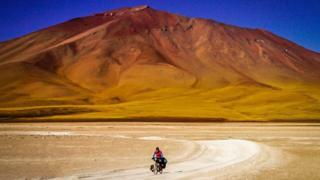 Just like that his money dried up, and the bicycle quickly became an important tool for survival. When I was two years old, we moved to Scotland so that my dad could find work. But the marriage didn’t work out and they separated. One time when I was visiting dad, an acquaintance of his asked me to sit on his knee, and ran his hand up my leg. I must have been around seven years old. After that I just remember feeling really bad. I felt like I was this awful, terrible girl. I think that was when I really started hating myself. As my two brothers and I grew older, my mum increasingly struggled to cope. She began to blame all of the family’s problems on me. Things between us were miserable and tense, and I withdrew even more. As my sixteenth birthday approached, I was deeply anxious, knowing this date was when my mum would no longer be responsible for me. As I feared, shortly after my birthday she chucked me out for good. When she shut the front door – that was one of the hardest moments of my life. That moment of standing on the steps down to the path, and having no choice but to walk away. It was like slow-motion. I just slowly walked and kept walking. Eventually they found me a foster family but all I wanted was to go home. I prayed to every God I had ever heard of for my family to take me back. One day I was walking back from my Saturday job and a car stopped, wanting directions to the lake. It was a group of men. They asked if I could show them the way, saying they would bring me back. I got in the car but they didn’t bring me straight back. They took me away and raped me. I didn’t tell anyone because I thought it was my fault. I believed it was me being punished for being “bad”. I dealt with it by blocking it out. By that time I was used to people doing whatever they wanted with me. I didn’t have any self-worth. I didn’t eat properly. I hated myself so much I wanted to die. The men came back for me and I refused to get in the car. I ran away. I was so desperate I went to a phone box and called my mum. I was pleading. I was crying, sobbing, saying I would do whatever she wanted. “I can be the girl you want to be,” I said. “Bad things are happening.” I told her what had happened. All she said was that it was my fault and I needed to change. After that all I wanted to do was die. At one point I was calling a suicide prevention line every 20 minutes. I knew I had to make a decision. I had to commit myself to living and not be consumed by thoughts of death. Picking myself up was one of the hardest things I had to do. I didn’t just suddenly turn into Superwoman, I crawled out of where I was. I enrolled in college. I bought a second-hand bike because it was faster and cheaper than the bus. I began cycling with a local bike club. I was the only female and I was cycling by myself at the back to start with. Slowly I began to keep up. I loved cycling fast because it was a great escape, but also my life got better. I was cycling so much that there must have been so many endorphins firing off at all times. I also had my first sense of belonging anywhere. When they built the velodrome cycling arena in Glasgow for the 2014 Commonwealth Games, I went along for a laugh. There and then I got offered a place for a competitive sprint team in Glasgow. At my first big competition, I sped past the previous Commonwealth Games medallist from Scotland to win Gold. It was at that point I had the opportunity to go to Iran. Looking back, it wasn’t the right time for me but there was a pull because I had family there. 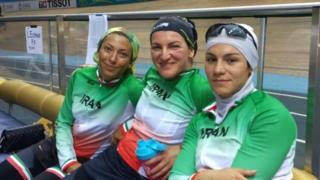 In Tehran, they asked that I test for the Iranian team, and offered me a place on their team. I thought, “This is my chance to connect with this country, and my father.” So I chose to race for Iran rather than staying to put in a qualification time for the Commonwealth Games in Scotland. I had never been involved in women’s rights before, but in Iran it was extreme. I started to speak out against the way the women riders were being treated. We had to train wearing hijabs which in the sweltering heat was horrible. Women had their mobile phones taken off them – the women, not the men. I was told this was so the girls were not distracted and messaging boys. I spoke up against the discrimination and bullying, but nothing changed. Eventually I left. I flew from Tehran to Turkey, where by chance I met a man who had been touring on his bike for months. I knew in that instant that that was what I was going to do. I got a flight back to Scotland, sold the little belongings I had and set off. Then I caught a flight to Nice, in France, and began cycling the world. It was in Turkey – along the sea of Marmara – that I met Lucy. I saw this light-coloured dog padding along by my back wheel. I pushed on the pedals and tried to cycle away, but she gave chase. I wasn’t planning to stop. 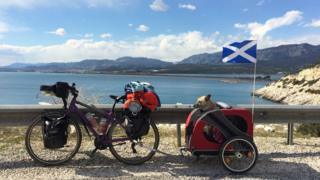 I was cycling the world – what was I going to do with a street dog? She tried to keep up, her shape deformed in the distance. After I while, I thought: “This is just wrong, Ishbel.” So I pulled the brakes. She eventually caught up with me, dropping to the ground a metre or so away. I held out my hand but she kept her distance. I went to find a camping spot nearby and she followed me. The following day I was planning to take her back to her village, but she was attacked by a gang of dogs. Seeing those four dogs – the fact that it was a group of them – and how she responded, transported me back to when I was 16. She didn’t try to run away. She didn’t try to fight back. I had been just like that, allowing people to hurt me. Everything became a blur. I threw down my bicycle and I was screaming, and charged with a power that I didn’t know. Somehow I fought them off. I took a few steps back and I just began sobbing, for Lucy but really for myself. I’d lived my life blocking out everything and there was this moment of realisation about what had happened. I made it my mission to get her to safety, because I knew what life was like without safety. I knew I had to start loving myself, and I didn’t know how, but I copied the way I looked after Lucy. Making sure she was safe, she was protected, she ate good food. And eventually it just became sort of automatic for me to be like that. Lucy was the first time I’d ever experienced unconditional love. It was transformational. 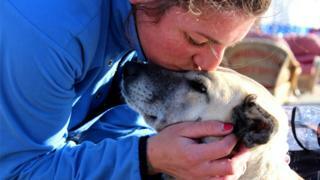 How could I protect this dog so much when I had failed to protect myself? My whole perception had been so distorted by everything I was led to believe about myself. It was like I had just woken up. I was shocked. I remember with Lucy outside my tent sitting in disbelief that that had been my life. It was only then I thought, “Wow Ishbel, what you’ve achieved, actually is incredible.” Before that moment I’d never been proud of myself. I promised Lucy I would help all the other Lucys in the world – all her friends. One dog – one street dog – changed my life. It’s almost like she did something that no human did. She rescued me. 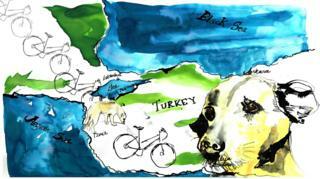 Ishbel’s book, Me, my bike, and a street dog called Lucy, is published in the UK by Bradt Travel.